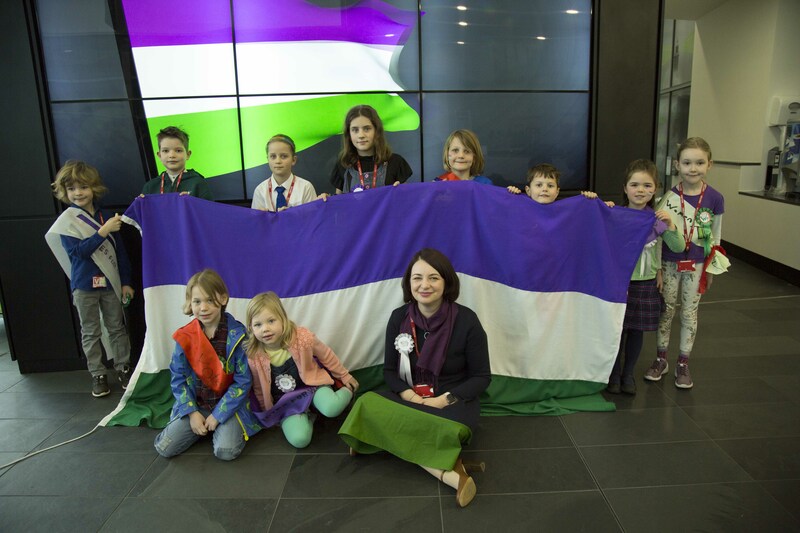 Earlier this year a Suffrage Flag began travelling around the UK to government departments and agencies to increase national awareness and mark the 100 years since women got the right to vote. We were delighted to host the flag at our head office in Exeter today. We received the flag yesterday afternoon from the Environment Agency and it spent the night in the Flood Forecasting Centre, a partnership between our two organisations. Our Suffrage Flag event then started in earnest this morning, with speeches by our Director of IT, Charlie Ewen, and Strategic Relationship Manager Rebecca Hemingway. 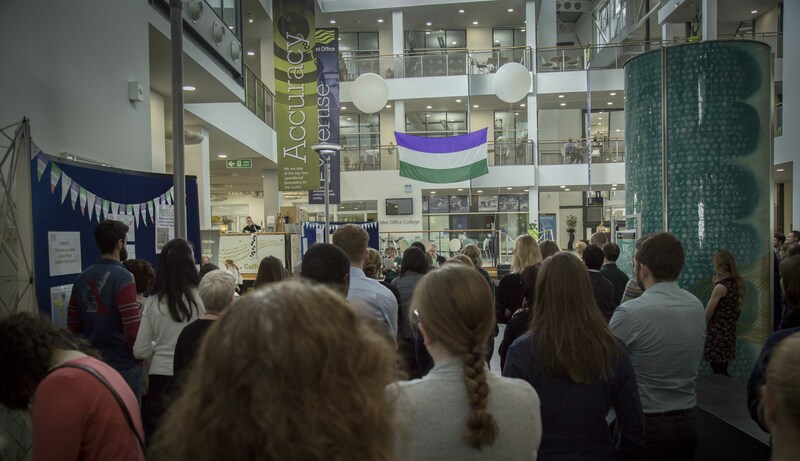 The flag was raised by weather balloon and marked the start of our Equali-tea, a family-friendly event for our staff and their guests, with opportunities to learn about and discuss women’s suffrage, inspirational women and the importance of diversity. Met Office staff at front-line stations also held Equali-teas to join in with the celebrations. 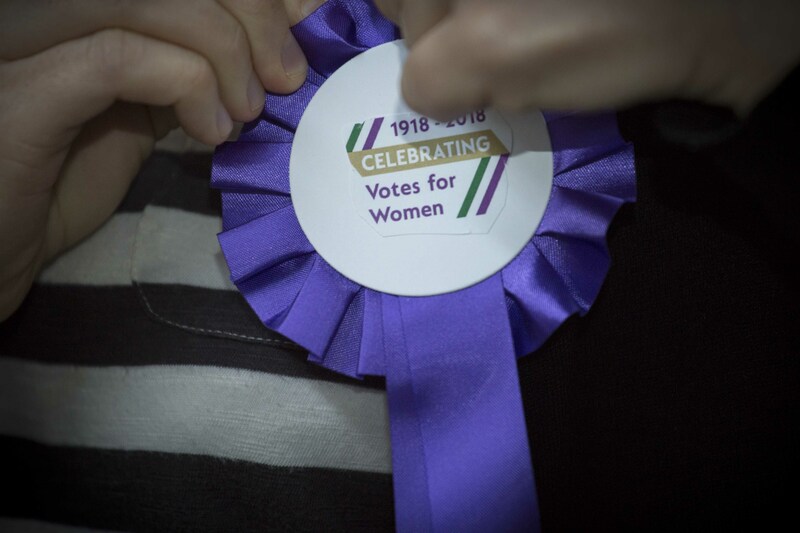 Attendees had a go at making their own sashes, rosettes and banners highlighting challenges for democracy and hopes for inclusivity and diversity (and some demands for more cake). The event ended as we handed the flag on to Exeter City Council. In a look to the future and as a reminder of the ongoing importance of ensuring equality and diversity, we invited local children to conduct the handover. Take a look at our photo gallery below to see some of the events of the past couple of days. 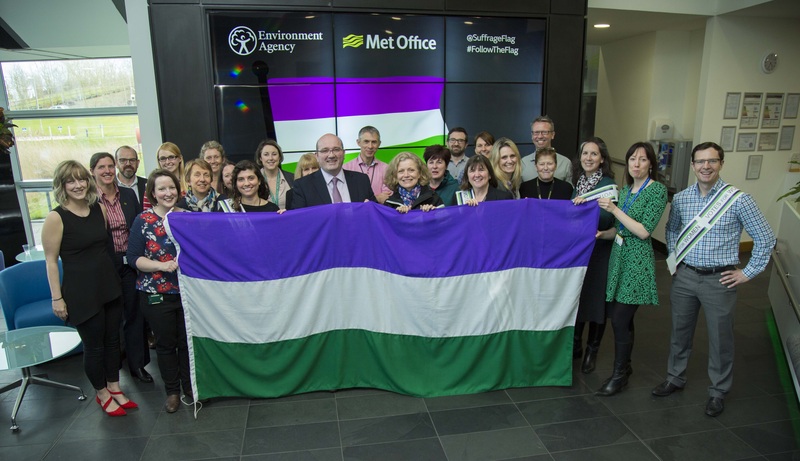 Met Office interim Chief Executive, Nick Jobling, receives the flag from Environment Agency staff including Chair Emma Howard Boyd. 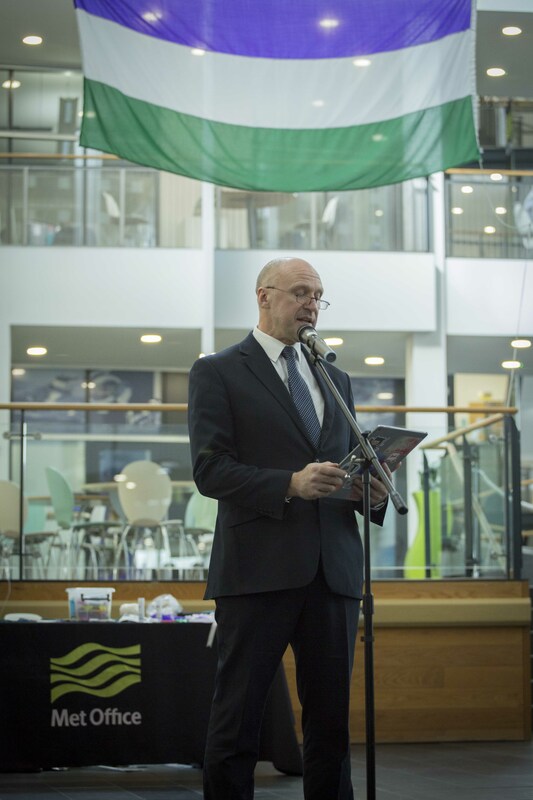 Met Office Director of IT, Charlie Ewen, launches our Suffrage Flag event. I’ve waited patiently for your blog to update on the combined temperature data of the last winter/spring, particularly in the light of recent scientific publications shwoing a dramatically slowing gulf stream and the impact that this is having on weather in Northern Europe/ the Eastern USA/North Atlantic. 1: Why you’ve stopped posting monthly blog summaries of the weather which used to highlight percentage variations from average readings for the regions – be they temperature, sunshine, rain, etc. I’m aware that you are still publishing monthly summaries, but these detailed comparisons from mean recordings no longer seem to be included. 2: Why you don’t attempt an overview of the last few months. Whilst apparently January was warmer than average ( for your particularly chosen 20 year slot), February and March were much colder. If you add in windchill, and maybe also reduced solar irradiation values for March, ( e.g as measured by our PV panels), the net result is a catastrophic decline in plant growth – at least in our part of upland Wales – though judging by similar howls of anguish from farmers across the UK and Northern Europe, this is by no means restricted in location. To avoid an overview seems to detach weather forecasting, or more specifically weather recording, from the vital role it can play in explaining weather impacts for those at the sharp end – be it in nature or agriculture. 3: Could you explain your decision to base your comparatives on the period 1981 to 2000? I assume that you have data for the last 17 years as well, so why not a rolling 20 year mean? Or make it a longer period? Assuming that overall temperatures have increased in the UK in recent years, which I think is what we’ve all been told, wouldn’t comparing this February and March’s figures against say, 1997 to 2017 averages, highlight an even more startling decline in temperatures than those that your monthly summaries actually record? Or maybe I’m completely wrong? I’m struggling to think of any other sphere of performance monitoring where you’d only compare things with events from 2 to 4 decades ago? I’m glad you find the climate summaries we share interesting. While we don’t always publish a summary on the blog, or as a news item on our website, all our UK climate information is available here https://www.metoffice.gov.uk/climate. This includes monthly, seasonal and annual summaries of the weather over the UK https://www.metoffice.gov.uk/climate/uk/summaries, updated a few days after the end of the month/season/year. You can find the data comparisons in the graphs, maps and data sets section when you click on year link. Thanks for the very detailed reply and background to how you display your data – Personally I do find your monthly summaries with colour coded maps really helpful and easier to get a quick appraisal of what’s happened over a period. I’m glad to see that you’ve just posted a blog incorporating these features recently, and do hope you might be able to maintain this sort of regular update in a blog post format.